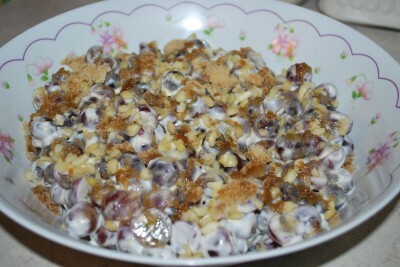 Barry loves Grape Salad……loves it. Annie loves grapes in general. Mommy doesn’t love grapes. Nope. I think I’ll pass. Thank you anyway. I make this for Barry though because I love the man – he fixes my mess-ups (like accidentally dropping a whole potato in the garbage disposal) and he deals with my mood swings. He deserves a medal of honor…..and Grape Salad galore. Let’s make it! This is a very simple recipe. 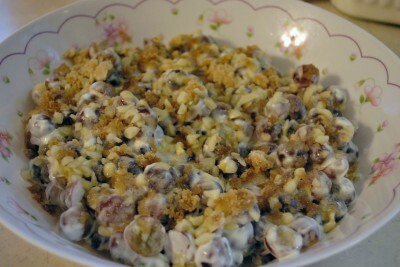 You only need grapes (duh), cream cheese, sour cream, white sugar, brown sugar, vanilla, and nuts. The type of nuts and grapes you use doesn’t matter. I used macadamia nuts because that’s what I had. I also used red grapes because they were on sale. The sale dictates our table. It’s a powerful force, that sale. 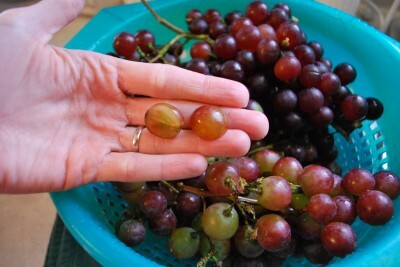 Sometimes you buy grapes and they’re GINORMOUS! I’m talking, you could bowl with those things. Then sometimes you buy grapes and they’re so small you could stuff them up your nose. The bag that I bought had some of each type, so I left the small ones whole and I cut the large ones in half. I microwaved my cream cheese for a bit to get it soft. Then I beat it together with the sour cream until they were smooth. Please don’t make fun of my ugly brown bowl. It’s sensitive. 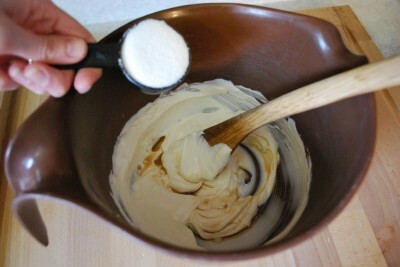 Add the white sugar and vanilla. Mix well until it’s all combined. I just realized that maybe I don’t like this recipe because it’s got cream cheese in it. I hate cream cheese. REVELATION! When it’s all mixed up, pour your grapes in there and mix well. Try not to pulverize them. Mix lightly. Mix lightly and carry a big stick. Just get them all covered. 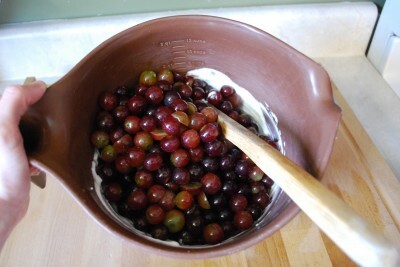 Pour the grape mixture into the serving bowl that you’re going to use. We won’t be mixing again, so pour it prettily into your bowl. 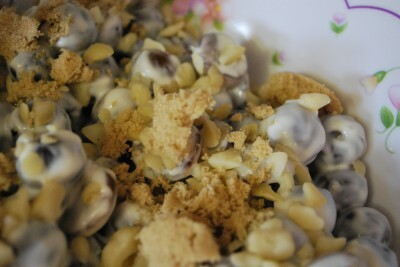 Sprinkle the top with the nuts of your choice. Take note of my lovely manicured hands. *Snicker* What’s a manicure?? Sprinkle the brown sugar all over everything. Lick your fingers when you’re done. It’s okay because no one is looking….and if they are, tell them to get lost. Cover your bowl and let it chill for several hours. It needs a little time for the sugar to soften or it will be a tad bit crunchy. Here it is chilled and all melted. It looks very pretty! It will keep several days in the refrigerator if it lasts that long. This is a great dish for taking to a potluck because it can be made in advance and you don’t have to worry about keeping it hot! And plus, everyone will love you and want to kiss you. You’ll be the most popular one at the party. You’re welcome. 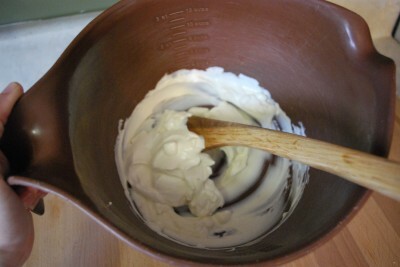 Mix softened cream cheese, sour cream, white sugar, and vanilla together. 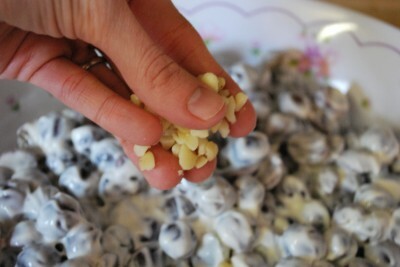 Fold the grapes into the cream cheese mixture. Pour into serving bowl. 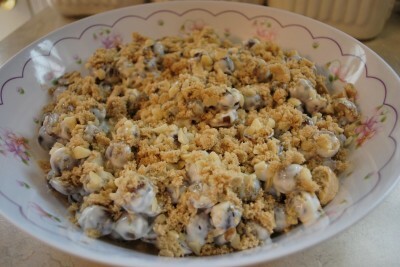 Sprinkle top with nuts and brown sugar. I love this salad. 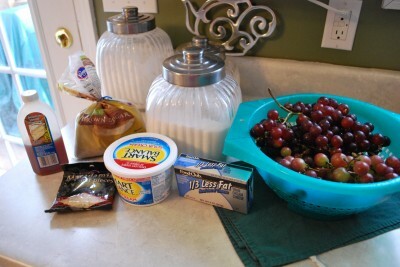 I love grapes and cream cheese!!!!! I’ll have to try it with fat free cream cheese and low cal sugar. Thanks for sharing!!! !